Everyone and I mean EVERYONE wants to sit upon the Iron Throne. There is a very uncomfortable chair they say is made from 1,000 enemy swords but it is really more like 200 forged by some guy named Shemp. Instead, they say it was forged by a Dragon because that sounds more majestic than A Guy Named Shemp and His Anvil. If you sit on the pointy sword chair you can brag you rule all of the Seven Kingdoms in this made up Dungeons and Dragons kind of world called Westros where everybody hates everybody - eventually. Each Kingdom has their own ruler who has a Special Chair or Bench which is more comfortable than the Iron Throne. All of the Comfy Chair Rulers (or their conniving relatives) want the Uncomfortable Sword Chair and will do anything to get it. This usually involves killing people at weddings. So mean! 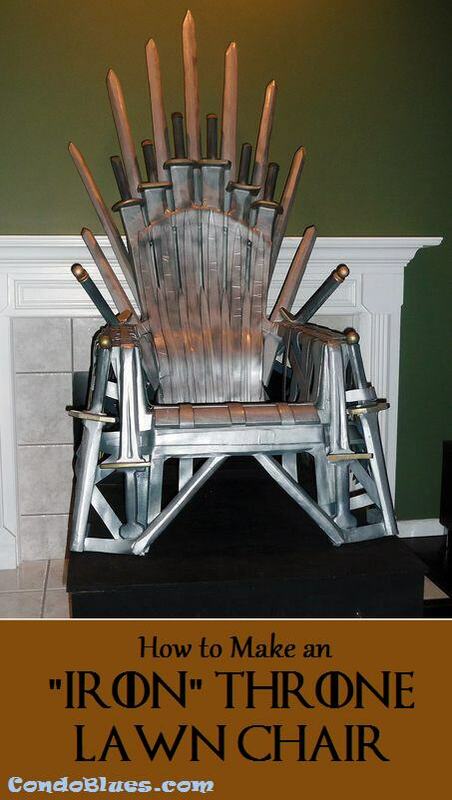 No one is smart enough to upholster the Iron Throne so the swords won't cut the person who plops their tush on it. Most Game of Thrones fans do. But a spare $30,000 a pop for a licensed replica of The Most Uncomfortable Chair in the Universe is hard to come by. If you want an Iron Throne without all of bloodshed, you need to be creative like flaming_pele. He made a Game of Throns Iron Throne from an Anarondack lawn chair! I totally want to make a set of Iron Thrones for my front porch!